My fascination with serial killers and other unsavory types came honestly. My father was a forensic psychiatrist who specialized in mass murderers. His book, Born to Raise Hell, chronicled his work with Richard Speck, infamous back in the 1960s for his brutal murder of 8 student nurses in Chicago. One of my own novels (Do Not Go Gentle) was even about a serial murderer. So the subject matter alone meant I was bound to love this book. More full disclosure: Gerald M. Weinberg happens to be my uncle. But that’s not why I loved this book. “Uncle J.” will be the first to tell you that I don’t love all his books. That’s why he often asks me to edit and review them. If you ask people to edit and review your books who are destined to love them, you’re wasting everyone’s time. Not only will you miss out on a rare opportunity to improve your work, but even the temporary ego-stoking won’t mean much more than winning first prize in a contest where you’re the only contestant. No, I loved A Death Lottery simply because it’s a great read for anyone who likes the head games of a rollicking good mystery (particularly one involving a serial murderer). And given that this mystery is being solved by math geniuses, the head games are particularly, well, heady. I also loved the way this book got into the world, but more on that later. The story is one of a series of mysteries involving a bunch of crime-solving mathematicians calling themselves the Residue Class who work by analyzing patterns underlying a crime. But this time a random killer who brags about having no pattern at all may be their Achilles heel. The issue at hand is how mathematics might be used to solve a mystery that ostensibly has no rhyme nor reason to it. That’s what the police think, anyway – understandably skeptical of a group of math professors, grad students, and the 15-year-old math prodigy narrator, who step on their turf. But the Residue Class is not going to let a pattern go undiscovered. You’ll have to read the book to see how they do it. 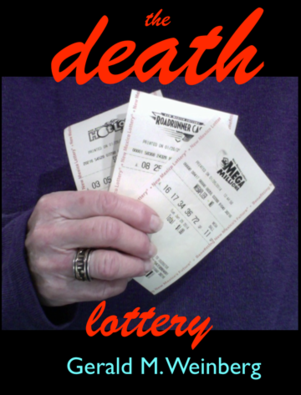 Sort of a mash-up of The Big Bang Theory and True Detective, The Death Lottery offers all the twists, turns, and mind-bending games you expect in a fast-paced, gripping who-done-it, interlaced with the nuanced interplay between a quirky, feisty group of math geniuses. The Residue Class’s approach to group dynamics is just as fascinating and original as their crime-solving mathematical machinations. Just as intriguing as the book was the publishing process. Many of us writers are exploring new ways to bypass traditional publishing, so I thought I was relatively well-versed on options. But this one was new to me, coming out of a company called Leanpub that claims to “empower authors and publishers” and encourages them to “publish early and often.” Their work-in-progress philosophy allows books, which Leanpub regards as start-ups, to evolve via reader feedback. Because they are repeatedly downloadable once you purchase them, books and all their typos and inconsistencies are no longer set for all time – a thought that is both liberating (but also kind of daunting) to those of us who haven’t learned why you should never peruse your books post-publication. So while I was in the middle of reading The Death Lottery, I received an email informing me that the book had been updated. Because the whole reading experience was digital (I had the choice of reading the book on a PC or Mac, Kindle, or IPad, iPhone, or other ebook reader), reloading the latest version and reading on was no problem. I’m still an old-fogey in some ways and prefer my books on dead trees, but I did enjoy being able to pick up where I left off using various devices, ranging from print-outs I made to read while riding my exercycle, screen versions while taking a break from my work, or my iPhone while waiting in line at the grocery store. And I did want to read on because I wanted to know how the story came out – which is, of course, the idea in a murder mystery. I suggest you go to Leanpub and check it out for yourself. Gerald M. Weinberg describes himself as someone “interested in helping smart people be happy and productive.” The author of over 70 books on human behavior and leadership including Weinberg on Writing: The Fieldstone Method, The Psychology of Computer Programming, Perfect Software and Other Illusions about Testing, An Introduction to General Systems Thinking, Becoming a Technical Leader, The Secrets of Consulting (Foreword by Virginia Satir), More Secrets of Consulting, and the nine-volume Quality Software series, he has also published quite a few fables and “nerd novels.” To purchase his newest novel, The Death Lottery, or view a free sample, visit the LeanPub website.